Natural colors. No food coloring used. Warning: this recipe may not turn out as expected due to the significant changes I made to the ingredient list. Proceed with caution. 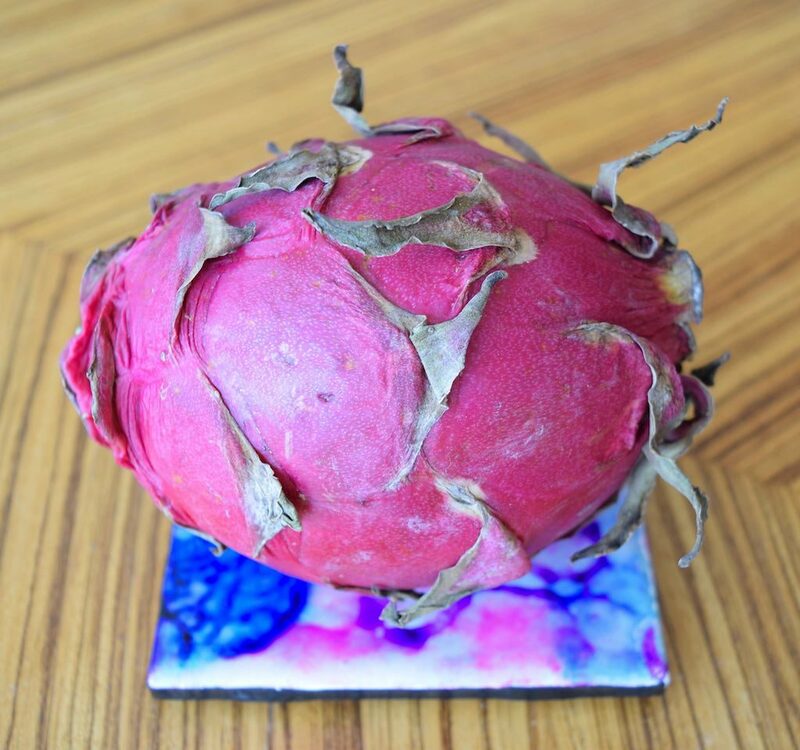 Dragon fruit is just plain weird. The outside looks like some kind of alien plant or creature from a bad sci-fi movie, while the inside of the red ones looks like raw meat. They’re not strongly flavored, but their subtle sweetness is delicious, especially when chilled. The two types I’ve seen in stores have a red outside with either white or red flesh. They each have tiny black, edible seeds, and there’s not a discernable difference in taste between the two. I prefer the vivid color of the red/red ones. While cutting up the red ones, though, it looks like it stains everything, but I do believe that applies only to clothes and skin. It washes away from cutting boards, countertops, knives, etc. very well. 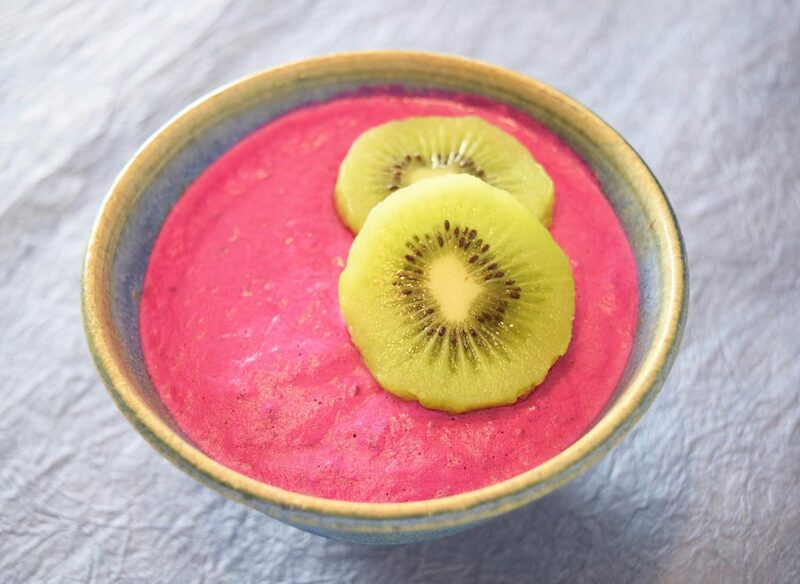 I got the idea to make a mousse out of dragon fruit after seeing a recipe for strawberry mousse here. Since dragon fruit and strawberries have just about the same water content (92%), I decided to use dragon fruit instead. Not to make anything easier than it needs to be, I also decided to swap the original heavy cream in the recipe for coconut cream (more on that, later). From what I discovered, one cup of cow cream has 820 calories and 88 grams of fat, while coconut cream has 780 calories and 83 grams of fat. Not a drastic reduction in calories or fat, but the coconut milk makes the dessert available to vegans. I’ve included the original recipe, along with tips for using coconut cream instead of cow cream. *Coconut milk/cream takes a bit more planning. Peel and cut up the dragon fruit into small chunks. 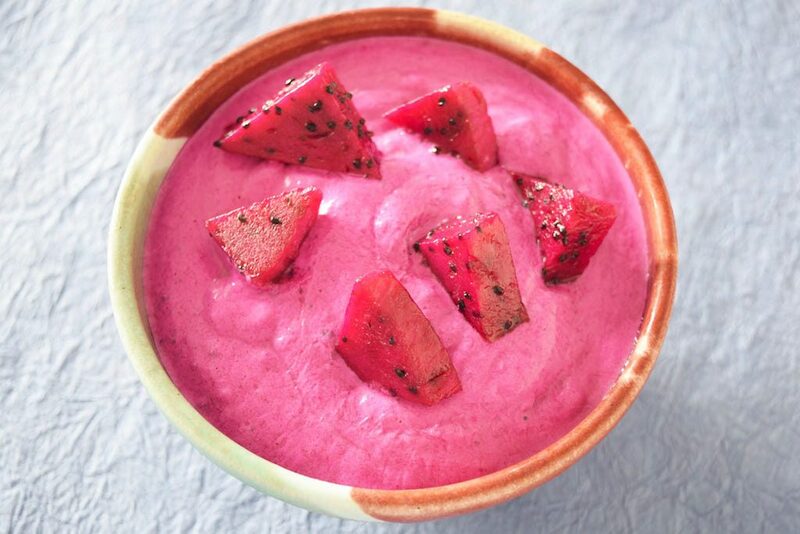 Put the dragon fruit and granulated sugar into a food processor or blender and pulse until pureed. Using an immersion blender in a tall, narrow container works, too. If using coconut milk/cream, put it in your refrigerator overnight, so the fat separates from the liquid. When ready to use, open the top with a can opener and carefully remove the solid coconut fat and put into a mixing bowl. You’ll need about 1.5 cups of solids, so depending on the fat content, you may need two cans. I used coconut cream, which hadn’t had time to separate (I had no patience to wait for it to cool enough), so more liquid got into the mousse than anticipated. This made for a more dense, pudding-like mousse. Use the coconut milk solids as you would cow cream. In a mixing bowl, combine the cream and powdered sugar and whip it into soft peaks with an electric mixer or beater. 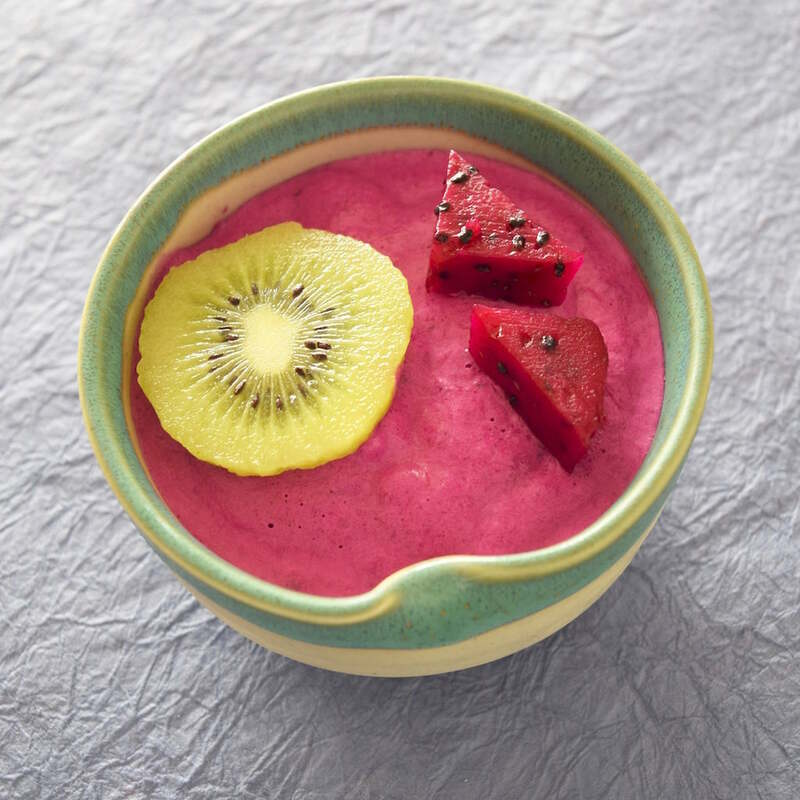 When the cream is whipped enough, add the dragon fruit puree and mix it in. At this point, put it in the serving containers and refrigerate for an hour or more before serving. If it’s a little soupy, you could throw it in the freezer for maybe 30 minutes before serving. Or, just use cow cream. I made this recently after making the same Strawberry mousse that you referenced as well. Decided to see if anyone else had tried to do Dragon Fruit Mousse and you had. Funny we followed the same (ish) original recipe but changed it to Dragon Fruit instead of Strawberry. Although I did make the Strawberry mousse. Cool. 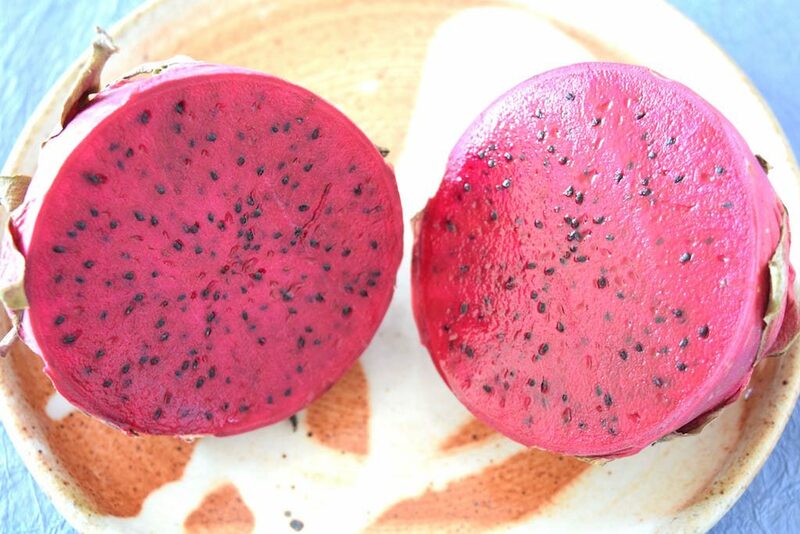 How did the dragon fruit version turn out for you?